Your child is precious to you and precious to God. Many parents want to mark the birth of a child with a special service of celebration. 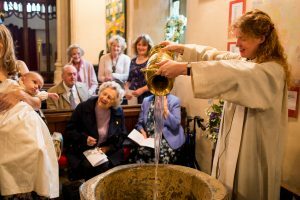 The Church of England offers two alternatives: a simple service of thanksgiving for the birth of a child or a christening service which includes baptism, marking the start of a journey of faith. Baptism is a ‘sacrament’ (a holy ritual to symbolise grace) in the Christian tradition that is traced back to Jesus himself being baptised in the river Jordan. In baptism, you as parents are thanking God for his gift of life, and making a decision to start your child on the journey of faith and asking for the Church’s support. For your child, baptism marks the start of a journey of faith, which involves turning away from all that is evil, turning towards Christ and becoming a member of the local and worldwide Christian family. Our parish churches are delighted to welcome anyone who has a connection to them. If you would like to explore baptism further then please contact the Benefice Administrator, Emily Elias at emilyjmelias@gmail.com or on 07538 105598.